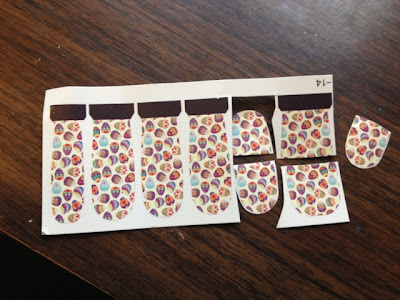 I have a set of nail strips from Born Pretty Store to share with you today! 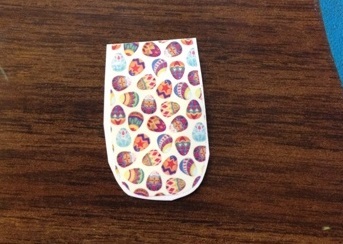 From 24 options, I chose this pattern since Easter is coming up! They come with a little file and instructions on the back. I had a little bit of confusion when it comes to applying these because there are 2 different sets of instructions on the back of the package. One says to treat them like a sticker and peel them off, the other says to treat them like a water decal. You cannot peel these off the sheet. 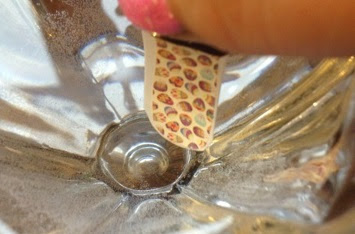 No matter how hard you try, you have to soak them in water to get them off. Thumb: Trimmed the decal to fit almost perfectly, with just a little hanging over the edge and submerged it in water for 15 seconds. These become super wet and slippery and are very hard to get used to and apply. After I got it situated, I trimmed the tip off with a file and let it sit for about 5 minutes to dry a little. By then, it didn't move around so much anymore, so I applied a coat of Seche Vite. The rest I cut normal. I just cut them off the sheet and trimmed a little off around the curve to make sure it fit okay. Since it shows to trim them to fit, I wasn't sure if the whole sheet, including the white background would come off, but all that comes off is the egg part and not the white background. 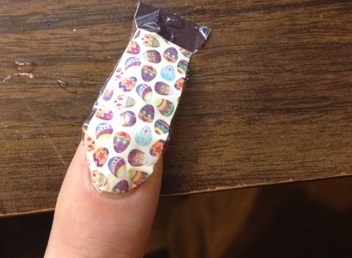 Pointer: Used one coat of base coat, Seche Clear, and submerged the decal for 15 seconds. On this one, I did everything immediate. Pulled it out of the water, slid it off the backing, onto the nail, and smoothed and topcoated with no waiting in between each step. Middle - No base or topcoat. Ring - Used a base coat, but no topcoat. Since Seche seemed like it was almost eating through the applique on my pointer and thumb 10 minutes after I applied it, I used Wet'n'Wild clear topcoat on my pinkie, with no base coat. The one I used is from the Wild Shine branch called Clear Nail Protector. Now, on one hand, the topcoat does do awesome job of smoothing out any folds you may not have been able to get flat when you applied the decal, but Seche is not the best candidate in my opinion! I know it says to apply these to clean, clear nails, but I wonder if I should have painted my nails white before applying these. 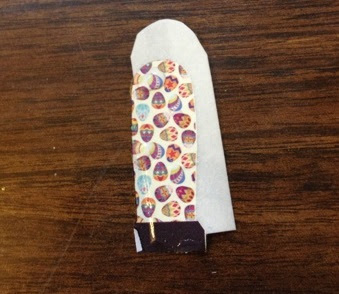 That way you wouldn't be able to see bare nail where there are breaks in the applique on my index finger. Furthermore, there are not very many sizes to work with in these. It looks to me like there's actually only three different sizes: a huge one for the thumb, a small one for the pinkie, and 4 in the middle that are the same. 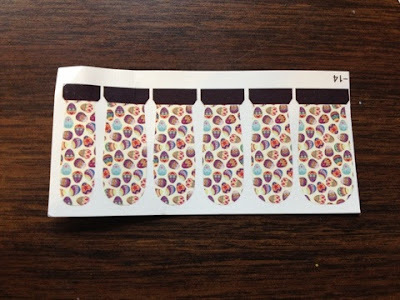 I began typing this review right after application, and the decals on my middle and ring finger started to lift and wear immediately. Knowing there was absolutely no way they could even last a day, I went ahead and applied a coat of Seche Vite to each of them, too, but used Seche Clear, the base coat, instead of the topcoat on my ring finger (which also started trying to eat little holes in the decal), and Seche Vite on my middle finger. It didn't eat at the one on my middle finger as bad, which I assume is because I waited quite a while longer to add it, but I'm not sure. I should have tested out different topcoats on these, but I only had these 3 clear polishes with me when I applied the decals. Overall, these decals are fairly nice. They do take some getting used to, but considering the price ($1.99 USD) they are worth a little more hassle, compared to the price of ones like Sally Hansen's Salon Effects. 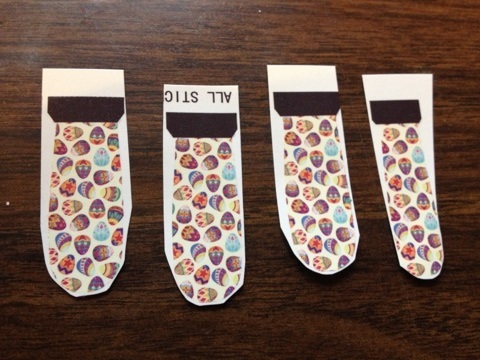 The pattern is super cute and detailed. I applied another coat of topcoat on the second day and they wore fine for 3 days, and by then I was just ready for a manicure change. When it comes to application, I've found that it is best to submerge them in water for 10-15 seconds, and wait a good 10-20 minutes before applying a topcoat. Topcoat is definitely needed, otherwise they'll barely last an hour and still look decent! Whether or not you use a base coat hasn't seemed to make a difference, though. You almost have to get them on the nail, make sure the hand you are smoothing it with is dry, or they'll pull off the nail easier, and once it is where you want it along the cuticle line, hold that lower part down with another finger, and smooth the rest out at the tip. This way it doesn't slide around as bad, and has more time to dry in place. There are only 12 in the set, so be careful when you apply them, because you only get to mess up twice! 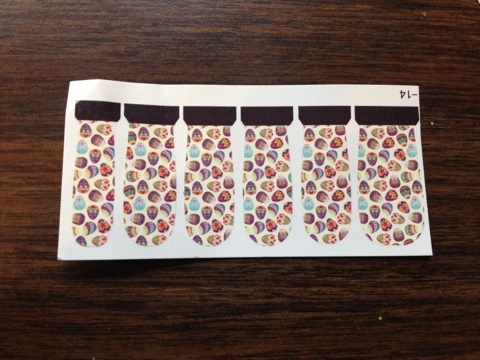 For that reason, I think these would be great to use as just an accent nail or two. That way, if you do end up messing a bunch of them up, you have 12 strips to play with and only need 2-4 (or however many you decide) to look good. My nails are actually short enough on my right hand that I was able to cut them in half and round the straight edge with scissors, so I had 4 1/2 strips left over. As always, if you decide to pick up a set of their nail appliques/decals/strips, or anything else, use my code ANL91 when you check out and you'll receive 10% off your order! This product was provided for review from Born Pretty Store, without compensation. All opinions remain both honest and my own.